As part of the carmaker’s plans to celebrate the 20 year milestone since opening production of cars in the UK, Honda has unveiled some interesting offers on its British-built motors. 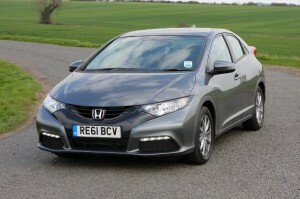 The new Civic, recently named best value car on the road by Parker’s, has had the cost of ownership made even more competitive with the availability of a £1,500 deposit contribution with a three year complimentary service plan, or for a payment of only £199 the plan can be extended to cover all servicing needs for 5 years. Honda customers purchasing the CR-V can enjoy an extension of the popular Spring offer of a complimentary trim level upgrade. The SE+ will be upgraded to the ES-T variant with the addition of £2,490 worth of extra equipment, including an integrated navi system, dual zone climate control, heated front seats and front and rear parking sensors. Buyers also have a £1,500 deposit contribution and a complimentary upgrade. Jazz, the JD Power Survey’s supermini of the year and Which?’s best used supermini, has received high praise for affordability and low running costs, but Honda wants to take that even further. It’s available with a £500 deposit contribution and 3 years complimentary servicing. The offers are available on new cars ordered between now and the end of September. This entry was posted in News and Views and tagged caption, car, climate control, ford, honda, Honda Civic, Honda customers, LS, mini, MoT, Parking Sensors, seat, UK, UK production by Steve Lumley. Bookmark the permalink.